The term “Trash the Dress” started as a symbol of not needing your wedding dress after your big day. It is more of a liberating feeling that you will not need to worry about the wedding dress and just have fun running around with it during your photo shoot. Trash the dress or “day after sessions” are totally wicked! There are many creative ideas – cut up your dress, burn your dress, go underwater with your dress, and etc. Just contact me if you want ideas. Of course, we will not totally destroy your wedding dress…unless you want us to! Just imagine your “Trash the Dress” photo session as a very artistic engagement photography session. 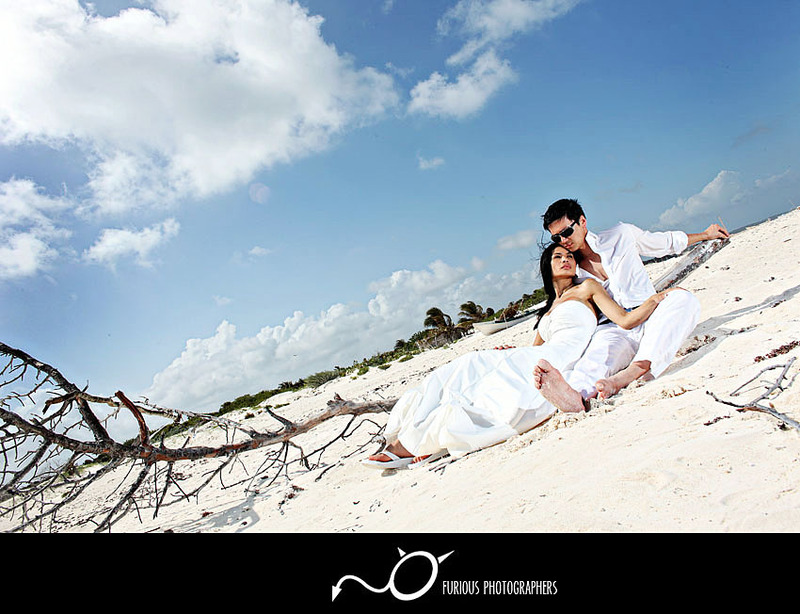 Anyway, here is a recent one we did with Tiffany and Ly in Cancun, Mexico. We ran around the beach and even rented a couple boats and photographed while we sped off toward the horizon. Tiffany and Ly wanted to do a day after session at Tulum. Since we were rejected due to permit issues, we were like screw this! We’re still going to get pictures so we rented boats! The water was definitely something that you can only see here in Cancun. The water looked so surreal! One of my favorite photographs of the day was during our photo shoot, a group of Italian tourists walked by and figured Tiffany and Ly were super models and we were the professional photographers. We convinced them to have a seat on the edge of a boat for a quick photo before they continued their way. Despite the extreme sunlight, Lawrence assisted with two Canon Speedlites to compensate the shadows while I directed and captured that epic photo! Enjoy.